This is a battle to escape from the bottom spot of Group B and both of these teams come into the game with a 1-3 record. The home side have lost their last two games while the away team have lost three games in a row so some team is going to bounce back to winning ways this week. 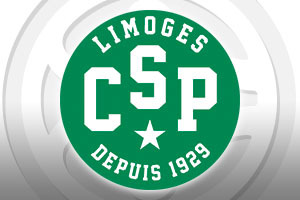 Limoges have already played at home twice this season and have lost both of their games, so they will be desperate to turn this around in this game. Considering that they will only have two home games in their final five games of the season, they cannot hit the halfway market with a 0-3 record at home. Limoges have struggled badly with turnovers, averaging 18 per game, which is the second poorest total in the league so far. Nobel Boungou-Colo will likely be used to block out the Milan attack but it will be a difficult challenge for him and his team-mates on Thursday. Milan started the season with a win in Round 1 but since then, they have lost every game. They were absolutely trounced by Anadolu Efes when they were last on the road but this game in France surely represents the best opportunity to get back to winning ways. Alessandro Gentile, even despite the form of the team, has been in fine individual form, serving up an average of 19.3 points per game, a tally which has seen him reach the top of the Euroleague scoring charts. If he can conjure up a similar performance against Limoges, Milan will surely move up the table. The bookmakers think it will be a tight one, although they do just back the away team. 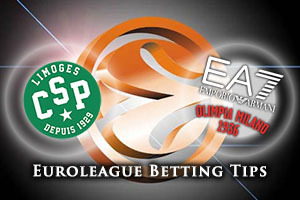 This means taking Limoges at +2.5 at odds of 1.90 is likely to be a decent bet for most people. If you are looking into the Over/Under market, look to go OVER 148.5 at odds of 1.90. Bet Now!